– Free tools, videos, slideshows and more! We live in a globalized world, not only in terms of trade and migration. More people than ever care about global development. But most people have severe misconceptions about contemporary global development. We know, because we have tested people’s knowledge. One of the main reasons for this is that students don’t learn to understand the world based on statistics and facts. Instead, we have a dramatic worldview formed by outdated school books and sensationalist news-stories. People intuitively believe that most things are getting worse. The dramatic worldview leads to irrational decisions by individuals, nonprofits, governments and business. For the first time in human history reliable statistics exist. There’s data for almost every aspect of global development. The data shows a very different picture: a world where most things improve; a world that is not divided; and a world where the fast population growth will soon be over. The world has never been less bad. But that doesn’t mean it’s perfect. This dramatic worldview has to be dismantled, because it is stressful and wrong. It leads to bad focus and bad decisions. Facts don’t come naturally. Drama and opinions do. Factual knowledge has to be learned. Thanks to a grant from IKEA Foundation 2013-2016 it has been possible for Gapminder to develop and spread teaching material. To decide what materials to create, we started by measuring what people know and don’t know about the world. The idea was to focus on the least-known facts. Unfortunately our surveys did not make it easier to prioritize. People had preconceived ideas about the World that made them score worse than random on most of the questions! We soon realised that the teaching material we had planned wouldn’t be enough. Worst of all: people were ignorant about their ignorance. They thought they already knew the basics about the World so they had no incentives to (re)learn. We had to start by making people humble and aware about their own ignorance before we could teach them successfully. Initially we got overwhelmed when we realized the enormous size of the problem. We had stumbled upon something bigger and more important that we had initially thought. We are now even more excited to work on it! We realised we needed to team up with real teachers to reach maximum impact. Instead of wasting our time blaming the media or condemning the human brain, Gapminder tackles the dramatic worldview by developing free teaching material. The goal is to dismantle misconceptions and promote a fact-based worldview. For the last 5 years the Gapminder School project has focused on exactly that: creating and spreading data visualizations, videos, slideshows, posters and other educational material for students to get a consistent and fact-based worldview. Gapminder Tools (gapminder.org/tools) let you compare hundreds of indicators and understand the health and wealth of all nations. It works on desktops, tablets and mobile phones. 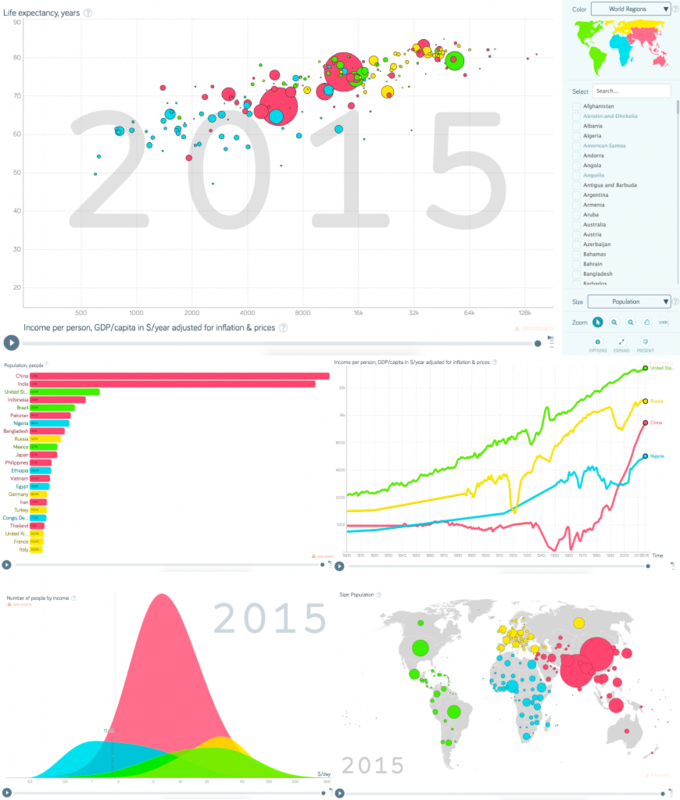 Gapminder tools makes it possible to see the data as bubbles, lines, mountains, ranks and maps. 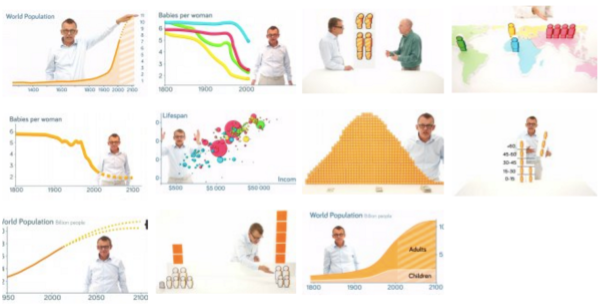 We created a series of 90-second videos to answer basic questions about the world (gapminder.org/answers). We also created free slideshows and posters, that anyone can download (gapminder.org/downloads) and easily modify, copy, use however they want to help the facts about our changing world to reach more people. Reliable global statistics exists for nearly every aspect of global development. And we are working to transform this numbers into public understanding. We haven’t finished this task yet, we still have much more to do! All Gapminder School material is freely available under the Creative Commons Attribution License.